Karl Ostrand (originally from Virgina Beach, VA) and Julie Ostrand (from Omaha, Nebraska) have been married for 10 years. We have 2 beautiful little girls (3 and 5 years old)...with one more on the way! My journey: I have been passionate about Africa for a LONG time and became especially interested in South Africa when Floyd McClung, director of All Nations, spoke at our church several years ago. I was impressed with his enthusiasm and ministry in South Africa! However, when Emme was born with Down syndrome in 2008, we thought it would not be possible to live overseas. We began to make plans to buy a home and lay our dream aside to serve in another country. Coincidentally, the weekend we picked out our dream home to build, we found out about another couple, currently working with All Nations, who also have a child with Down syndrome. We were surprised...and encouraged! 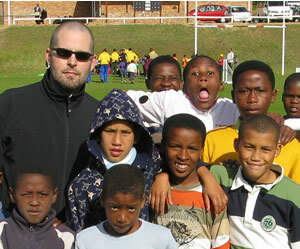 Through research and a visit to Cape Town during the summer of 2009, we discovered that South Africa is uniquely equipped with excellent medical care and high quality programs for Down syndrome. Read an amazing story about "the envelope" that got me there. My vision: My vision is to be able to use soccer as an avenue to minister to kids who live in terrible conditions - surrounded by poverty, HIV, drugs and every manner of hopelessness. While it's true that soccer is an escape from the despair for a few brief moments - more importantly we want to use it as the tool to introduce children to Real Hope. More than learning the skill of soccer, kids just want to know that one person cares about THEM. Most importantly, Julie is a mom. Before moving to Africa, Julie worked in web site development and project management for 10 years. My journey: I have NOT been passionate about Africa for a long time. In fact, quite the opposite. I'm sure I've seen too many movies - Tears of the Sun, Hotel Rwanda, Black Hawk Down, Blood Diamond - all that didn't help my husband's cause to move our family to Africa. I knew I was called to the nations and missions as a teenager - give me Asia, give me the Middle East, give me India. But Africa? Couldn't we die? All of that to say, as I began to learn more, my heart changed. I was very impressed with All Nation's approach: Partnering with Africans to change the world! My Vision: My vision is to minister the love of Jesus through creative programs (dance class, job skills training, small business, etc.). 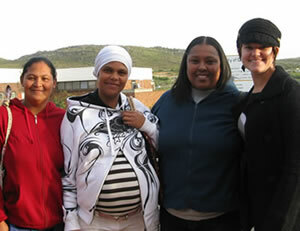 We had classroom teaching time and also worked in Ocean View, a Cape Town township. Research has shown that church membership is decreasing world-wide, not increasing, so this is a new approach to missions, based on David Watson’s model (one of the most successful church planters globally with a movement of over 250,000 churches). The model: Making friends with people (in a township in our case) and starting Discovery Bible Studies - where people experience reading the Bible together, discovering what God is speaking to them directly and then deciding how they can obey the Bible passage they just read. Sounds simple - but it changes lives! Often times these Discovery Bible Studies turn into actual churches, but our focus is not on erecting church buildings or starting elaborate church programs.We want people to experience God speaking to THEM and changing their heart and life! Karl is passionate about soccer and was able to volunteer at a soccer clinic and a soccer tournament. Soccer unites people and cultures, transcends values and defies prejudice. Karl says, "I am committed to using the language of sport to communicate the most powerful message of all: God’s passionate love for his children as communicated through his Son, Jesus Christ. It’s a story that’s changed my life, given me purpose and hope, and I long to tell this good news to others!" We feel God wants to meet both our spiritual and physical needs. One of the biggest problems in South Africa is unemployment. 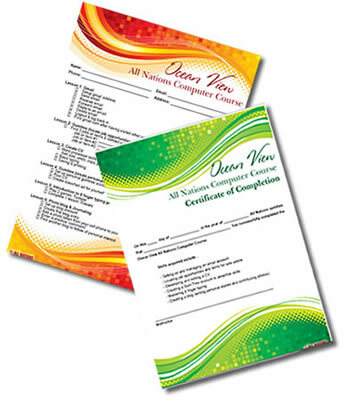 Most women in Ocean View are single moms who have dropped out of high school, are the primary care taker for several children and are unemployed. We started a computer skills training program so that these women can take charge of their own income opportunities (create a resume, look for jobs online, have an email account to email potential employers, etc.). A job is the first step out of the hopeless web of poverty! 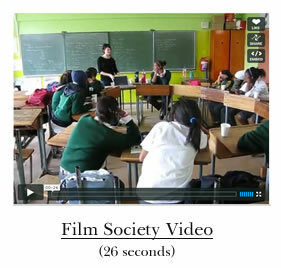 Tenth girls attended an after-school club called The Amazing African Women Film Society. Our goal was to build relationships and encourage the girls with inspirational speakers who were also a spiritual beacon. Speakers were successful women from South Africa, mostly colored (including a doctor, hair designer, social worker, CEO, and fashion designer, and administrator). As a bonus, we trained the girls how to film the speakers, conduct interviews, and make a movie. Many of the speakers told personal stories of overcoming abuse, with the help of God, and achieving success and breakthrough in their life. Watch the final movie (the girls made)!